Since history has a way of repeating itself, commemorating the past as way of finding the right way forward is a necessary process in all organizations. In this context, the University of Seoul (UOS), which celebrates its 100th anniversary this year, should take the time to look back as it considers the road to its future prosperity. In this article, The UOS Times is going to explore the 100-year history of UOS with various topics, including the many changes it has undergone. 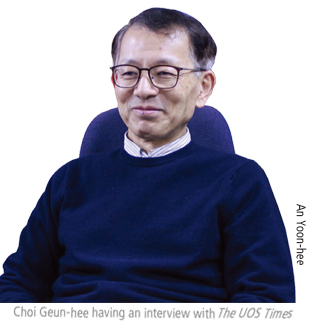 Together with an interview from a professor Choi Geun-hee and a fourth grade student, The UOS Times will let the readers know various changes of at UOS between the 1970s and now. Let us start with how UOS evolved over time by looking at its several name changes. In 1918, Kyung Sung Public Agricultural College was established by the Japanese colonial government as way to maintain control over agricultural policies in Korea. The school required two years to graduate. In 1920, the completion time was changed to three years. 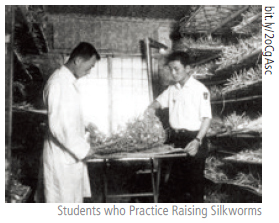 The school gained many students at this time because a new department was created: the Department of Sericulture. In the 1930s, when the price of agricultural products plummeted in the aftermath of The Great Depression, the Japanese government implemented the “Increased Yield of Rice Plan” to turn Korea into a rice supply base for Japan. To meet the excessive demand, Kyung Sung Public Agricultural College added departments related to agriculture including the Departments of Agricultural Civil Engineering, Veterinary Sciences, and Livestock. The majority of them majored in agriculture, while 193 graduates majored in sericulture. Graduates of Kyung Sung Public Agricultural College promoted Korea's modern agricultural technology and management ability. Kyung Sung Public Agricultural College enrolled male students only. The number of Korean students far outweighed the number of Japanese students. However, Japanese students were granted special enrollment privileges due to the proportion of Japanese people living in Korea at the time. To enrich their experiences, students at Kyung Sung Public Agricultural College took a yearly school trip. Although plans sometimes changed, in general, students visited Mount Geumgang, Manchuria, or Japan. With the unconditional surrender of Japan on Aug. 15, 1945, Kyung Sung Public Agricultural College moved into a new era. 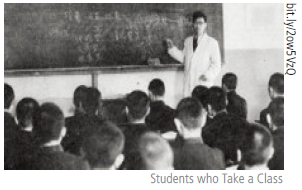 The first reformation of the Korean educational system in 1946 turned the school into a six-year middle school. The name was changed at this time to Seoul Agricultural Middle School. In 1951, the middle school was divided into a middle and high school and the name was changed again to Seoul Agricultural High School. Unfortunately, during the early period of its existence, Seoul Agricultural Middle School’s students had to enlist as soldiers after the breakout of the Korean War (1950~1953), a tragic part of our history. 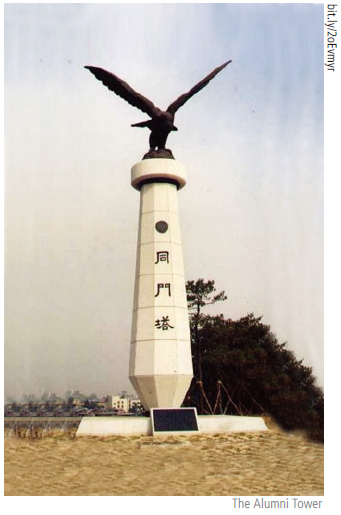 Compared to other schools during the war, our school suffered greater damage because Cheongnyangni was a center for distribution and transportation, and Baebong Mountain, behind the campus, was a strategic location during the war. 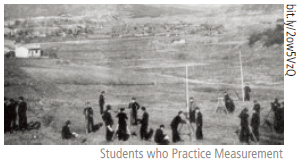 The damage from the Korean War claimed not only land but human resources, since some of the students were conscripted by the North and deployed into the front lines. 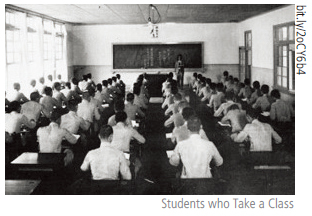 Students who went to school after the restoration of Seoul also joined the Korean Army and spent five years in the military. 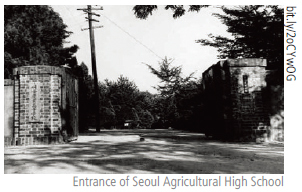 In 1954, Seoul Agricultural High School became affiliated with Seoul Agricultural College. After two years, Seoul Agricultural College was converted into a four-year-course college and Seoul Agricultural High School was abolished. This is the end of the story of the middle and high school. 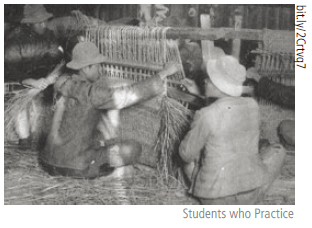 On March 21, 1956, Seoul Agricultural Middle and High School was raised to the status of a four-year-course-college: Seoul Agricultural University. During Seoul Agricultural University’s earliest period, it had the Department of Horticulture, Department of Agricultural Engineering, Department of Veterinary Medicine, and Department of Sericulture. In 1959, Seoul Agricultural University established a library in order to create more classroom space and enlarge other facilities. The number of students fluctuated from 1961 to 1962. However, from 1963 to 1973, Seoul Agricultural University maintained an enrollment limit of 120 students per year. From a current perspective, past regulations on students looked like an attempt to terminate personal freedom. Seoul Agricultural University regulated students nearly all the time, not only on-campus but off. For example, students were strictly prohibited to use coffee shops and billiard halls. Additionally, students were required to wear their uniforms and not violate any disciplinary measures. According to Jeonnong, the school newspaper of Seoul Agricultural University, a research club and the SCA (the Christian student council) were created in 1957. Additionally, many clubs which first appeared in 1961 were initiated by students. In regards to student movements, there was an active participation in politics at this time. When the Korean government signed the treaty between Korean and Japan in 1965, a demonstration took place. SeoulnongdaeHakbo, the Campus Newspaper for Seoul Agricultural University, was founded on Aug. 13, 1964. It described in detail the students’ struggle against the treaty. According to the news, about 200 Seoul Agricultural University students gathered on the campus the day the treaty was finalized and censured what they perceived as humiliating diplomacy. Since then, the student movement at the school had been leading the way in the protection of democracy in Korea. As Seoul became more metropolitan, an increase in urban problems followed. From this, a future-oriented study was conducted highlighting such areas as urban engineering, sanitary engineering, urban administration, and landscape architecture. To address these needs, in 1974, Seoul Agricultural College changed its name to Seoul Industrial University to educate specialists who could research urban problems and manage the city of Seoul. 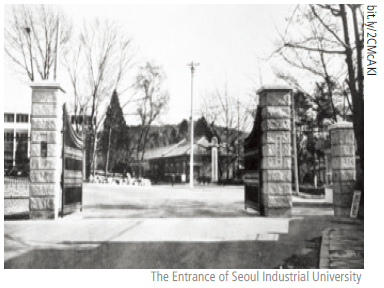 From 1974 to 1981, Seoul Industrial University created seven new departments and the number of admitted students increased to 1,070. In 1981, Seoul Industrial University changed its name again to Seoul City University. In March 1982, Seoul Industrial University officially became Seoul City University. At the same time, Seoul City University created programs in the fields of liberal arts, social science, natural science, and engineering. The Graduate School of Urban Administration opened in November of that year and was created so Seoul City University could cultivate students who would open the doors of the urban administration field. From 1982 to 1983, Seoul City University had eight departments. 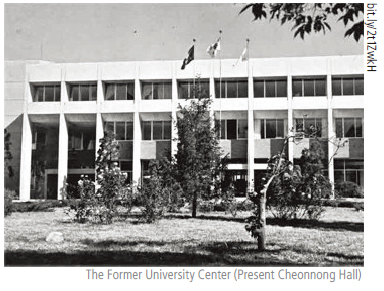 After 1983, Seoul City University invested in constructing facilities such as the Student Hall, University Museum, Main Stadium, Music Building, Liberal Arts Building, and Main Library. Finally, with this effort, Seoul City University was elevated to a comprehensive university in 1987. It consisted of four schools, 22 departments, and 3,647 enrolled students. As a comprehensive university, President Chung Hee-chae tried to develop Seoul City University by gathering more students and professors, enlarging educational facilities, and improving the curriculum. Additionally, to fulfill the necessity of international exchange, Seoul City University set up a sisterhood relationship with The State University of New York. Meanwhile, from 1987 to 1994, Seoul City University opened another 13 departments. In 1995, President Kim Jin-hyun first integrated some departments and then opened the School of Business Administration and School of Electrical and Computer Engineering. An important change during this period was the establishment of the urban science college and institute of urban science. This led Seoul City University to become an urban science-centered university. Seoul City University also did not neglect the necessity of foreign exchange. The Student Council was revitalized in early 1985 by the student' participation in the democracy movement. As the school became known asSeoul Industrial University, the spectrum of club activities gradually became more varied. In 1983, the Student Hall was completed and the club room was allocated to the students. As a result club activities were improved. Regarding the student movement, 1987 was the year when the Korean people’s aspirations and enthusiasm for democracy reached their peak. The desire for a direct presidential election system was one of the demands. To achieve a democratic society in Korea, our students actively participated in democratic movements. The professors of Seoul City University also issued a declaration against the state of affairs. Since 1997, Seoul City University changed its English name to University of Seoul in an effort to become more internationalized. Japanese students came to the University of Seoul and completed a specialized education program. Thanks to these efforts, the Ministry of Education praised the University of Seoul for a strong reformation of its education in 1997. In 1999, UOS created the Graduate School of Education which provides master courses in Korean Education, English Education, History Education, Mathematics Education, and Teaching & Learning ·Counseling. Additionally, UOS activated exchanges from the inside and outside of the country. From 1999 to 2002, UOS set up a sisterhood relationship with three foreign universities and interchanged with seven domestic universities. President Lee Sang-bum made medium-and long-term campus development plans in 2005 with the goal of maximizing the ability to create infrastructure, use space efficiently, and specify UOS’s identity. From this plan, the Liberal Arts Building and Architecture and Civil Engineering Building were built to augment the Information and Technology Building. The Student Dormitory, Law School, and indoor tennis courts were also built. Since 2005, when the Institute of International Cooperation and Education was created, options to apply to dual degree program have increased. UOS contracted with San Francisco State University, the University of Texas at Dallas, and the Miami University. Also, in 2008, the Ministry of Education and Science Technology selected UOS as a developing education capacity business. This is because the educational opportunities and results were excellent. In 2012, UOS founded the International School of Urban Sciences which aims to educate global urban officials and construction professionals. In 2017, UOS began enlarging its dormitory to meet the demands of students and has begun building a Citizens Culture Education Center for members of UOS and local residents. After the university was promoted to a comprehensive university, the Continuing Education Center was established as an affiliated institution to directly expand educational capacity for citizens, and a number of additional affiliated institutions for community contributions were created. Some examples are below. Seoul Citizens University offers all citizens of Seoul with high-quality lifelong learning opportunities in a diversified information society. This opens them up to an era of globalization, while fostering a self-governing citizenry. In an era of local autonomy, it is responsible for helping to create a harmonized quality of life in Seoul and carries the support of the Seoul Metropolitan Government. Today, the rapid industrialization of urban areas poses many social problems. In addition to this, the needs of the community have been diversified, so community welfare is required now more than ever. In response to these demands, UOS opened its social welfare center in 1997 as part of its mission to serve as a leader in the civil society and provider of welfare to the community. The Global Volunteering Activity Program supports volunteer activities abroad during the summer vacation period to teach UOS students the importance of giving back. This program has been held annually since it first began with a visit to Haran Village in China in July of 1999. People’s lifestyles and ways of thinking continuously change as time marches on, and this fact is well reflected in the life of the students at UOS. To show the maximum differences in school life according to the passage of time, The UOS Times interviewed two people who have attended UOS, with about 30 years of a discrepancy between them. The first person is Professor Choi Geun-hee (Dept. of Urban Administration, ’77) who is now a professor of UOS and head of a centennial celebration committee. 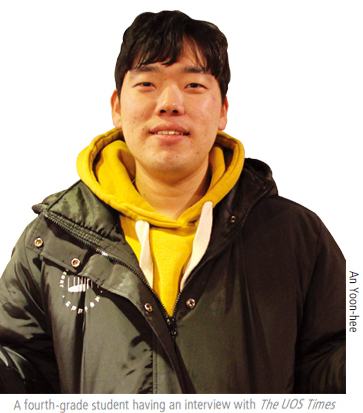 The other one is Lee Myung-su (Dept. of Urban Administration, ’13), a fourth-grade student currently enrolled at UOS. Enjoy our interview focusing on how the similar questions are answered in vastly different ways. 1. Could you explain about the landscape and the atmosphere of the campus at that time? It seems like only half the buildings on campus were constructed at that time. The Sky Pond, which was only three to four diameters wide, was also very small. The water in the pond seemed to only brush against our ankles, unlike today’s pond which has a huge depth and a lot of fish inside. There was an orchard which grew pears and peaches in the place where the main library now exists. Since there were not that many students, the whole school knew each other by sight and the campus was quiet and peaceful. However, the campus always smelt strongly of tear gas because of demonstrations. 2. Please describe the academic departments in the 1970s. There were only three liberal arts majors - the Department of Urban Administration, Department of Public Administration, and Department of Industry Business Administration - and five natural science majors. 3. Were there any popular lectures? Well, I cannot remember because it was so long ago. I think it was related to the number of students; the scale of the lectures was so small. Since there were so many mandatory subjects, it was hard to sign up for lectures in other departments. Even fourth-grade students had required courses. In the Department of Urban Administrations, the lectures of professor Yoon Jae-pung were popular because it was helpful for students who were preparing for the civil service examination. 4. How was the school cafeteria? UOS did not have a school cafeteria at that time, so students usually took their own lunch boxes to school for their meals. We had meals on the lawn located in front of the main library, where Baebong Hall is now located. It was a good time to have a lot of chats with classmates and seniors. There was a construction site restaurant in the place where the Student Hall is now located. We sometimes had meals there with the construction workers. The restaurant was a bit shabby and dirty, but the rice soup was hot and delicious. Next to where the front door of Baebong Hall is now located, there used to be 100 KRW coffee vending machine. It was very popular. At that time, if someone set up a vending machine in a public space, it was possible to earn enough money to make a living. 5. Would you explain about the employment situation at that time? Before President Park Chung-hee was assassinated in 1979, the economy prospered. Construction businesses in the Middle East were booming, and the country was attaining economic growth at the rate of 10 percent each year. However, when I returned to school after completing my military service, these positive aspects of employment had changed for the worse. When the Chun Doo-hwan regime was taking power, a second oil shock occurred. These situations made attaining employment very hard. I cannot remember the year exactly, but sometime around the early 1980s, Samsung Electronics recruited only 50 employees. I remember the low number because my best friend entered the company. Lee Byung-chul, the founder of the Samsung Group, was the interviewer, and a fortune-teller was sitting beside him. Since the employment rate was not aggregated at that time, I do not know the exact number. However, all of my friends were studying for The Higher Civil Service Examination. If some graduates found it difficult to get a job, they were still able to find work in Seoul City through a special employment process. 6. 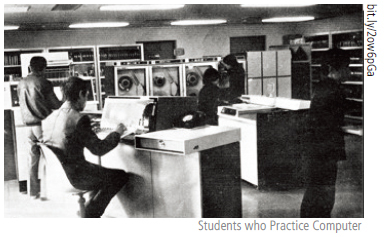 How were the infrastructure facilities around UOS in 1977? It is no exaggeration to say that there were no facilities for amusement at that time. There was only a billiard hall. If any more facilities were built around UOS, they would have soon failed because the number of students was so small. There were only 199 graduates at the ceremony held in February of 1980. Two billiard halls and one go club were the only amusement facilities around UOS. We played card games in a rented room when we had the time. 1. Please explain what kind of campus you have seen for the last five years. I usually take classes in the 21st Century Building and Mirae Hall. There used to be assembly hall in the place where the space for the 100th anniversary building is now located. Except for the Music Building, I think there is no building that has been newly built since I entered UOS. 2. Could you give us some general information about the lectures at UOS? Are there any popular lectures among students? UOS students have to take at least 130 credits to graduate. Students in the Department of Urban Administration usually take 18 credits a semester. Our department can take a maximum of 48 credits of the liberal arts courses. We get information about which lectures are the most popular from seniors who we first met before registering for the spring semester. I think what constitutes a “popular lecture” is whether it is easy to get credits or how often the professors cancel classes. For me, the lecture Modern Society and Human Health was interesting. We had to submit a report about a free topic related to health. My topic was not to drink carbonated drinks for a month, and it was exciting to research this because it is related to our everyday life. I also liked the lectures about sports including soccer and recreational activities. 3. Could you introduce some places to have fun around UOS? I usually go to Lotte Cinema located in Cheongnyangni Station to watch movies and go shopping. There are a lot of bars around UOS, so I go to those places to drink alcohol. 4. Have you ever participated in demonstrations? Yes. I participated in the demonstration for the impeachment of former President Park Geun-hye every week. However, besides this one, I have never participated in any other demonstrations. I have just observed them. 5. Please explain the employment environment nowadays. There are a lot of female students who have already passed the civil service examination. Also, there are students who are studying to enter both private and public enterprise. Most of these students are studying to enter enterprises because they have failed to pass various certification exams such as CPA, certified labor attorney, and so on. There are not as many students who are preparing to become civil servants compared to past. Instead, students who would like to enter public enterprise has increased. [Public enterprises include the Korean Railroad Corporation, Korea Gas Corporation, and the Korea Expressway Corporation, and private enterprise include Samsung Electronics and Hyundai Motor Company]. A lot of changes have happened to UOS since 1918, the year the university was established. Over the last 100 years, UOS has continuously formed a tighter bond with Seoul City, and this relationship is stronger now more than ever. UOS has consistently tried to develop itself across many fields, and this article explained some of the most successful changes the university has undergone. Some of the changes have included construction of new buildings and departments and more study abroad opportunities. Also, UOS symbolizes the spatial history of Korea in the most fitting way possible, maintaining its roots in the same place for 100 years. As it has done until now, UOS is preparing for another 100 years with the collective passion of all UOS students, professors, and employees.